Matilda Love Divine? | Scuffalong: Genealogy. Matilda Love Divine? – Scuffalong: Genealogy. Back when I took terrible notes, I wrote this on a slip of paper: LUCY MATILDA LOVETT DIVINE. All I remember about it is that my grandmother told me that this was the name of a Henderson relative. There aren’t any Lucys in the family, so I’m fairly certain she was talking about her grandmother — whose name actually was “Ludie” or “Loudie” and who died when my grandmother’s mother was a toddler. If I probed for more details, though, I didn’t record them. 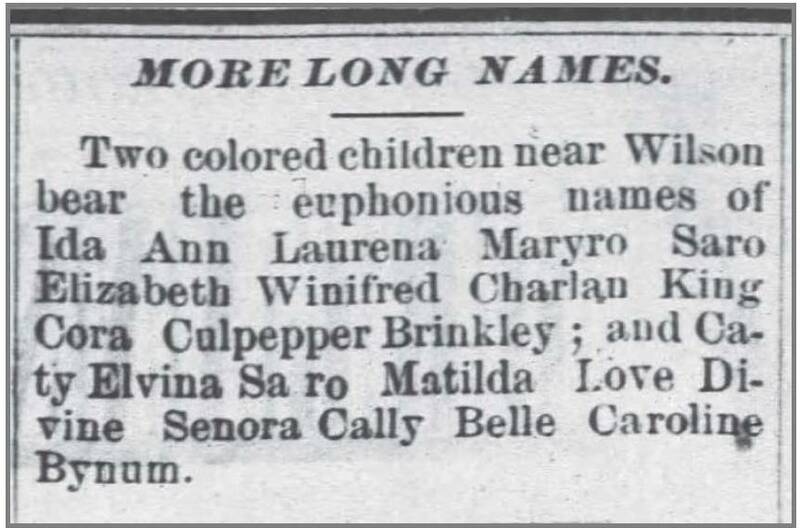 Wilson Advance, 27 July 1883.
much further afield, a mention in Maine’s Daily Kennebec Journal, 1 August 1903, of Ruth Matilda Love Divine Seymour Terry Belle Caroline Finney. So what to make of this? Was Loudie Henderson really another of the “Matilda Love Divine” sisterhood? Who in the world was the original? And how did her name seize popular imagination? ← When time came for women to vote. so interesting! I wonder why the name “Caroline” is also part of the mix. So are “Terry Bell” and “Seymour.” It seems there must have been one original, but who? A fictional character? A star of the minstrel stage? My great grandmother was from North Carolina and her name was Mary Matlida Live Devine Annabell Seymore Sarah Saline. This is very interesting. I would live to Find out more. Thank you. I would, too, Leslie! I hope others will see the post and chime in — maybe we’ll get an answer! Thanks for reading and commenting.